With this function you can register with the server so you can acquire permanent statusses (like admin statusses or auto-voice). When you clicked on this function you will be presented a window where you need to fill in a Login Name and a Password (twice, purely for checking purposes). When you click on Register you will hear and see (in the Event window) wether the server has granted you registration. When something goes wrong (like if your Login Name is already taken) the reason is shown in the Event window. If you suddenly decide you do not want to register you can click on Cancel and the window will be closed. 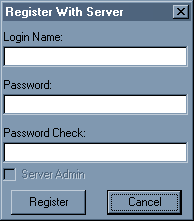 When you want to enter the server as a registered member you have to fill in your login name and password in the Connection- Connect menu, make sure you have selected the option registered right above the login name. You can now connect as a registered member. This setting is set up in the permission system.